What happens when the Christmas story of Joseph and Mary is told by the worst kids in town? A good-hearted comedy appropriate for all ages. NOTE: The Sunday, December 2nd performance will begin at 2pm, to be followed by the Boring Tree Lighting at 4pm. The goal of the Community Connection is to provide a comprehensive community calendar for Boring, Damascus and our surrounding communities. We also will be working to expand the number of social, educational, and service opportunities for everyone in our area. (2) Please share this information with your friends and neighbors! (3) A great opportunity to get involved! 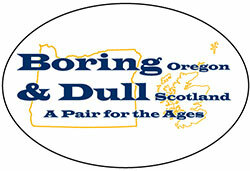 Celebrating the pairing of Boring & Dull, the Clackamas County Board of Commissioners in 2012 proclaimed every August 9th to be a Boring & Dull day. The State of Oregon passed a law in 2013 stating this is “A Pair for the Ages” and every August 9th will be Boring & Dull Day. 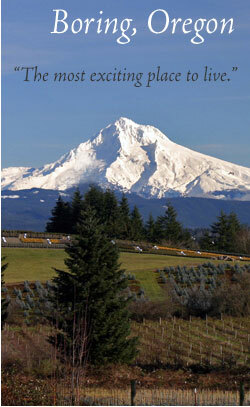 Come join your Boring neighbors and experience our Spirit of Community. Plans include Free Ice Cream, live music and special guests.